Ms. Doris Davis, 87, has lived in her southeast Houston home since she had it built in 1959. In speaking with the Forward Times (FT), Ms. Davis shared her stories about her upbringing in Houston. She was one of the founding members of Pisidia Missionary Baptist Church when it started in 1972. For over 37 years, she worked her way up from housekeeping all the way to becoming a licensed Vocational Nurse (LVN) at Jefferson Davis Hospital. Ms. Davis knows a thing or two about medicine and about working in a hospital, which is why she called her primary doctor when she felt something strange going on with her health. According to Ms. Davis, her church mission had gone to a home where she had just taught a Bible lesson when all of a sudden her head began to hurt really badly. Ms. Davis states that she called her Primary Care Physician, Dr. Sandra Scurria, and told her that she was not feeling well and that her head was hurting, to which Ms. Davis states that Dr. Scurria told her that she would call an ambulance to take her to Park Plaza Hospital. Ms. Davis says she never made it to Park Plaza, but was instead taken to Memorial Hermann Hospital, and didn’t know why. Ms. Davis doesn’t remember much of what happened at Memorial Hermann, but states that one day she woke up and was no longer there. This time, she found herself at Garden Terrace Alzheimer’s Center of Excellence in Houston on May 6, 2014, and had no idea why she was there either. Because she was regularly given drugs and heavily sedated the majority of the time, Ms. Davis vaguely remembers how she got to Garden Terrace, which on their website prides itself as a premier Alzheimer’s and dementia-focused nursing home in Houston; but she says it has nothing to do with her suffering from Alzheimer’s or dementia. Her recollection of that day’s events and past events were as crystal clear as if they had happened a few minutes prior. Ms. Davis does, however, remembering the frustration she had with the staff who she says refused to allow her to call her family or her pastor. She kept a book with important phone numbers in it, including her pastor, but states she was denied use of the phone and no staff members would make any calls for her. She felt like a prisoner and was terrified, she recollects. Ms. Davis states that she was given medication by needle on several occasions, as soon as she asked the hospital staff to call her family or her pastor, and that she was knocked out after receiving every shot. This happened for about 2-3 days, she recollects. After a few weeks at Garden Terrace, Ms. Davis was then moved to La Hacienda Nursing Home on West Orem, where she currently resides. It was during this entire time that Ms. Davis’ nightmare became even darker. Monica D. Shaw has served as the president of the Bayou Terrace Civic Club for over ten years. She has had the responsibility of looking out for the interests and protection of all residents in her community over that period, especially the most vulnerable – the elderly. On May 10, 2015, Shaw went to visit Ms. Davis and deliver her some Mother’s Day flowers when she received some disturbing information involving Ms. Davis’ situation which forced her to jump into action on behalf of this senior citizen. 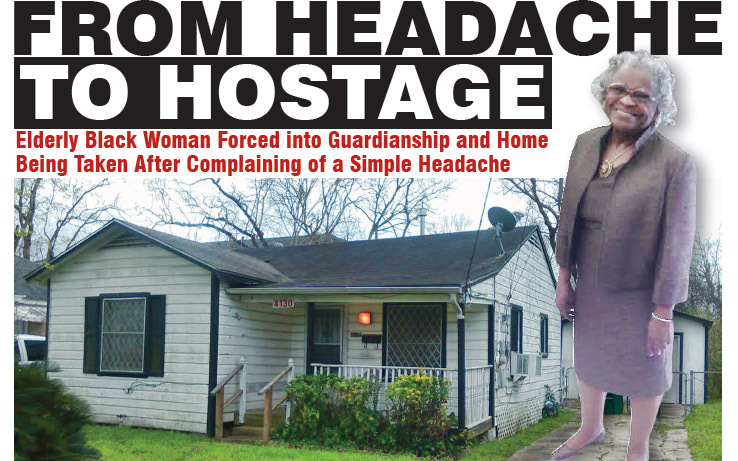 Shaw has been aggressively seeking to stop the actions that have displaced Ms. Davis from her home; allowed her money to be spent and made her an unwilling “ward” of state through the Harris County Guardianship Program (HCGP). According to Shaw, Ms. Davis had been forcefully removed from her southeast Houston home, and legally ordered into the HCGP by a judge. She contends that not only has Ms. Davis been taken from her home against her will, her house has been placed on the market and is in the process of being sold as part of a cash sale orchestrated by the HCGP. Shaw has been on a mission to find out how this elderly 87-year old African American female could feasibly be in this situation when she has all of her wits about her and is still able to walk and care for herself. People are generally referred for Guardianship services by Adult Protective Services, physicians, hospitals, family members or friends. According to Shaw, it was Dr. Chris Merkl, a known Psychiatrist, who initiated a Guardianship referral request on May 16, 2014 for Ms. Davis to be placed in the HCGP. Another doctor is listed as having seen Ms. Davis, but he did not complete the referral. Interestingly, Dr. Merkl is also an “Appointed Doctor” in Probate Court #1 for the same HCGP that he made the referral concerning Ms. Davis to. Dr. Merkl has also been mentioned in an article from April 2015, called “Guardianship in Texas Qualifies the Disqualified and Disqualifies the Qualified,” written by Attorney Candice Schwager that appeared on Examiner.com, where she talks about the issues she witnessed surrounding the Guardianship process here in Texas and specifically highlights Dr. Merkl’s role in certain cases. The FT reached out to Dr. Merkl to find out more about his initial assessment of Ms. Davis and his recommendation she be placed in the HCGP, but was unable to reach him or hear back from him after leaving a message with his office prior to this story going to print. Because these doctors are deemed credible professionals, it is not uncommon for a judge to accept a referral from them and move forward with their recommendation. Such was the case involving Ms. Davis, as she was placed in the HCGP and her case has been handled by Judge Mike Wood in Probate Court #2. Ms. Davis was deemed Incapacitated in July 2014 and a Guardianship (Person/Estate) was established with the HCGP. Upon entering the HCGP, the process of liquidating all of Ms. Davis’ assets began and several of her accounts were closed at different respective banks, and a single new account was opened in her name under the HCGP. On July 29, 2014, the court ordered that Attorney Chris Forbes be appointed Guardian Ad Litem. The FT did speak with Judge Wood, who indicated that the case was still pending and that he was not at liberty to speak on the status of pending cases or could not discuss any medical and other health information with us due to HIPAA (Health Insurance Portability and Accountability Act) laws which keeps that information private and protected. Going even further, Attorney Valerie Milholland, Asst. County Attorney for the Office of Harris County Attorney Vince Ryan, went before the judge and insisted that Ms. Davis’ house be sold, along with its contents, in order to take care of Guardianship expenses and her personal needs. The FT reached out to Attorney Milholland and spoke to a representative from the Harris County Attorney’s Office to get more information on the status of Ms. Davis’ home and why she was placed in the HCGP, but did not hear back from them prior to this story going to print. When the order was given to allow HCGP to spend that amount of money from the estate, Monica Shaw knew she had to do something more, so she had an application to Appoint Successor Guardian filed by Attorney Andrew McGee on her behalf. It was then that Attorney Milholland, on behalf of HCGP, sought to sell her home in order to pay for these Guardianship expenses ordered by the court. On Aug. 6, 2015, an order was signed by Associate Judge Ann Green to sell Ms. Davis’ personal property, including her home, at a private sale for cash. Soon after the order, an Application to Sell Real Property was executed by Aline Kyle-Taylor, the appointed Harris County Guardian who has the Power of Attorney to act on Ms. Davis’ behalf. Ms. Davis was served with a Notice of Sale by a Precinct 7 Constable, although she states no prior notice had been given. The process to sell her home was well on its way. The FT spoke to Aline Kyle-Taylor to discuss Ms. Davis’ case, but she declined comment and indicated her supervisor would reply, but did not hear back from them prior to this story going to print. Shaw immediately filed an Objection to Sell of Property in order to stop the sale of Ms. Davis’ home, and started to see that things had seemingly gone from bad to worse. On Feb. 23, 2016, Shaw took Ms. Davis to court for a hearing on the Objection to Sell her property. Upon hearing the case, Shaw states that Judge Wood gave her one week to have Ms. Davis seen by a doctor that would state that she is “Not Incapacitated” and submit a report to court indicating that by Mar. 2, 2016. Shaw helped Ms. Davis schedule an appointment the very next day, Feb. 24, 2016, to visit Dr. Ivan Spector, who had previously treated Ms. Davis from 2007 to 2010. Dr. Spector performed an exam to determine her incapacity, and it was determined, per a letter submitted to courts by Dr. Spector on behalf of Ms. Davis, that she was “Not Incapacitated” as initially reported by the initial referring doctor. To date, the case is still pending in Judge Wood’s court. Per Judge Wood, the letter was received from Dr. Spector and is being reviewed. In the meantime, he also indicated that the Ad Litem Attorney has requested another doctor re-evaluate Ms. Davis to determine her status. The HCGP was organized in 1992 by the Harris County Commissioners Court to provide management and monitoring services to indigent persons who were deemed incapacitated by the Probate Courts and to serve as a last resort service for poor adults who are unable to care for their own physical needs or financial affairs because of physical or mental conditions. Currently, the HCGP provides Guardianship services to over 1,400 wards and is the largest Guardianship program in the entire state of Texas. About 40 percent of Harris County wards are 40 to 59 years old and 28 percent are 60 to 79. The majority of them have mental illness, a developmental disability or mental deterioration, such as Alzheimer’s disease or dementia. The HCGP is also designed for poor adults who have been exploited, neglected or abused, and have no family members or friends willing or able to care for them. This is not the case concerning Ms. Davis. Her nephew lived with her at the time of her forced removal from her home, and he had no say concerning the Guardianship decision. Ms. Davis states that she is being forced to be in a Guardianship program and pay for a nursing home that provides nothing but a roof over her head. She has been under constant worry about the status of her house, because she doesn’t know if it has been sold to someone else. She is being given psych meds regularly; makes her own bed; changes her own sheets; bathes herself; feeds herself; never sees the doctor assigned to her care; takes walks alone; dresses herself; and her church members wash her clothes for her. Ms. Davis has a home that is paid for, where she was peacefully living prior to this fiasco, and she wants this nightmare to end so that she return to the only place she has called home for over 50 years. Shaw is seeking to become Ms. Davis’ legal guardian and has several concerns that she hopes to see addressed and several questions she is seeking answers to. The FT will continue to monitor this situation and seek answers to the question that Shaw has, as well as the many other questions surrounding how Ms. Davis, who appears to be of sound mind with a near spotless recollection of things, ended up in the HCGP in the first place.